I finally crawled out from under the covers of my bed and a pile of tissues (ewww, I know, I cleaned them up) and made my way to my laptop. I've watched more episodes of Friends, Call the Midwife, and Downton Abby episodes in the last few days on Netflix than I care to mention. I was hit really hard with a nasty sinus/ear infection. I have a whole new sympathy for little ones who have ear infections, OUCH! As I mentioned last week I had another treatment that weakened my immune system. This latest infection has confirmed what I had previously thought. I'm done with treatments that weaken my immune system! They're just not for me. I've tried several and I've seen little benefit and lots of miserable side effects. I'm not exactly sure where that will leave me as far as a treatment plan but I know I can't do those treatments anymore! Anyway, let's talk about something that's way more fun than sinus infections, okay?!? When I opened my box from Bella Blvd for CHA 2015 I fell in love with the Bella Bows. They are the perfect size, the perfect thickness, and they're felt so they add a ton of texture to any project. When I saw the rainbow of colors that they came in I knew I wanted to add as many of them to a layout as I could in as many colors as I could. To keep the layout from getting too busy I chose a white piece of cardstock as a background. On the back of the Bella Bows there is a tiny piece of foam adhesive. I removed this adhesive just so I could more easily stitch the bows with my sewing machine. I kept embellishments (other than the ninety million felt bows) to a minimum to let the bows and the photo shine. As I mentioned earlier these bows are such a perfect thickness. They aren't too bulky but they add some dimension. I'll be ordering many more packages of these bows. They'll be landing in stores soon. I didn't even use all the colors of bows on this layout but those green ones are my favorite. 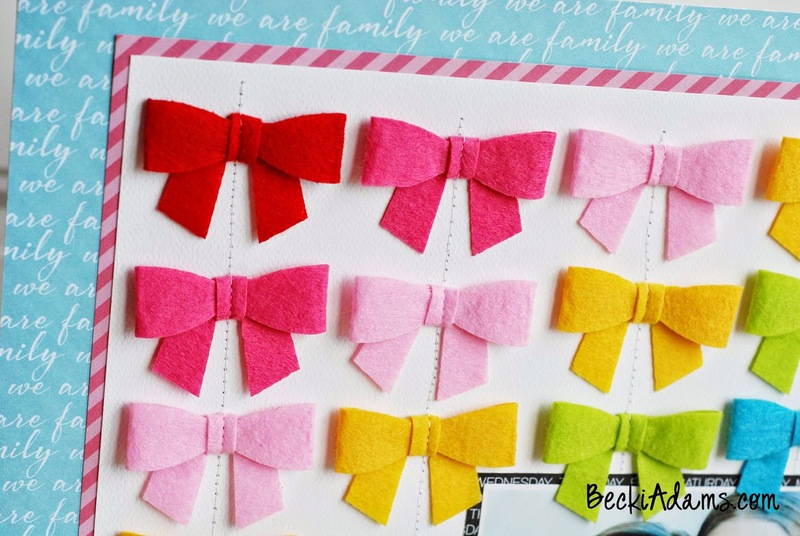 What color of Bella Bows will you order? Aw, pshaw Becki I only counted 20 bows! LOL And, yeah, I think the lime=y green bows are my favorite! Although if they have a hot pink or magenta, I will have to get those (my little grandie, Bella wears a lotta, lotta hot pink!). LOL, yes, I may have exaggerated the count a little bit ;) There are two shades of pink, one is called punch the other is cotton candy. They're both on the layout. 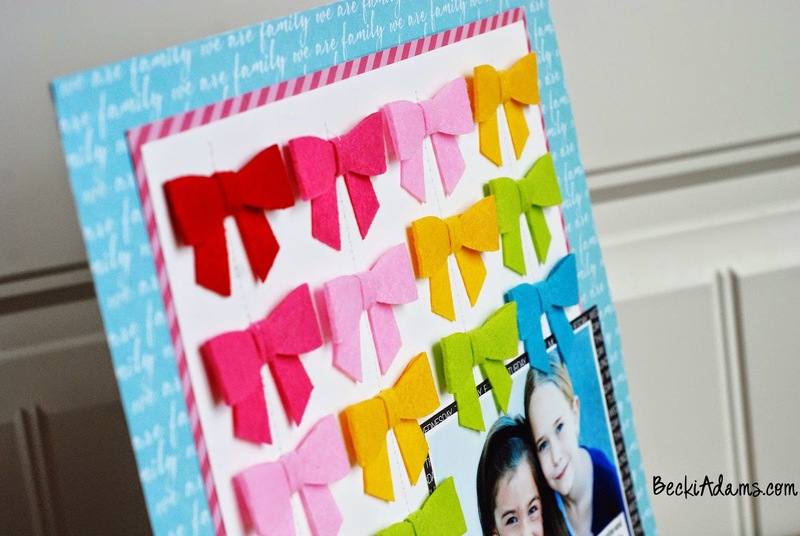 These bows would be perfect for little headbands. 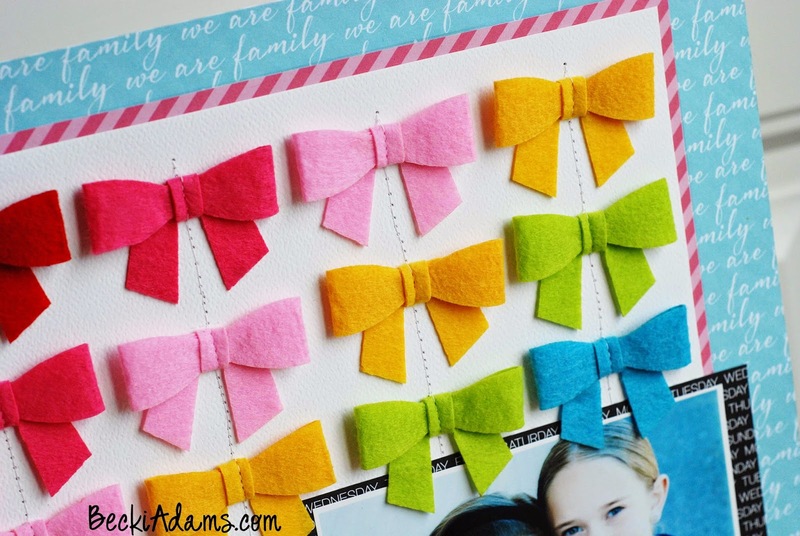 Those felt bows are just way too cute! Aren't they cute?!?! I love 'em! LOVE this! the colors you patterned are sooo awesome!! great layout! This is darling. I love how you arranged the bows. The papers look great. Of course, the cutest of all are the two darling little girls. What a sweet layout. Awww, thanks Jean! I'm pretty partial to these two little girlies too. They are sweethearts! 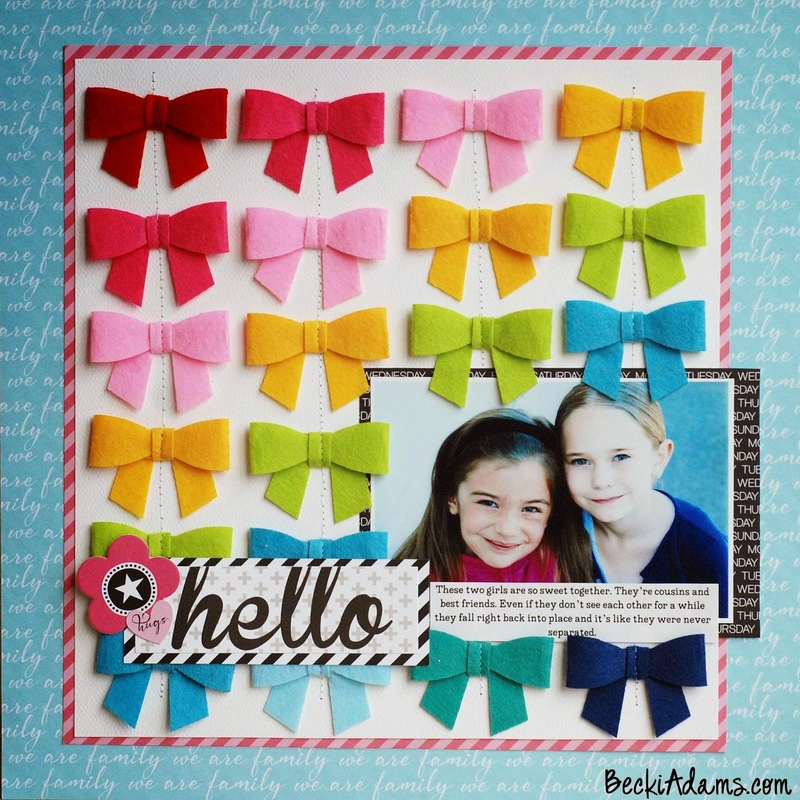 What an adorable layout...the bows are so cute! !